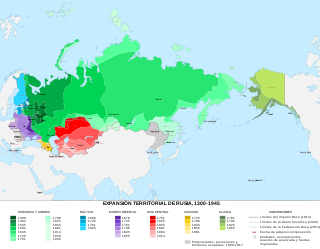 Territorial changes of Russia happened by means of military conquest and by ideological and political unions in the course of over five centuries (1533 – present). The name Russia for the Grand Duchy of Moscow started to appear in the late 15th century and had become common in 1547 when the Tsardom of Russia was created. For the history of Rus' and Moscovy before 1547 : see Kievan Rus' and Grand Duchy of Moscow. An other important starting point was the official end in 1480 of the overlordship of the Tatar Golden Horde over Moscovy, after its defeat in the Great standing on the Ugra river. 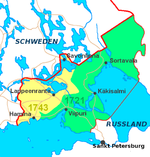 Ivan III (reigned 1462-1505) and Vasili III (reigned 1505-1533) had already expanded Muscovy's (1283–1547) borders considerably by annexing the Novgorod Republic (1478), the Grand Duchy of Tver in 1485, the Pskov Republic in 1510, the Appanage of Volokolamsk in 1513, and the principalities of Ryazan in 1521 and Novgorod-Seversky in 1522. After a period of political instability the Romanovs came to power (1613) and the expansion-colonization process of the Tsardom continued. 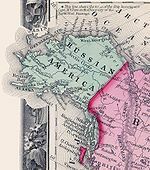 While western Europe colonized the new world, the Tsardom of Russia expanded overland - principally to the east, north and south. 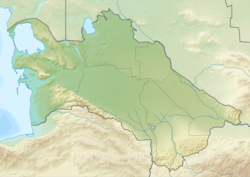 This continued for centuries; by the end of the 19th century, the Russian Empire reached from the Black Sea to the Pacific Ocean, and for some time included colonies in the Americas (1732-1867) and a short-lived unofficial colony in Africa (1889) in present-day Djibouti. * Blue=Russian fort; Yellow=Khanate of Khiva. 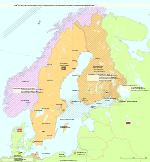 After the October Revolution, Poland and Finland became independent from Russia and stayed so until modern times. Russia proper had become "Soviet Russia" and eventually the Russian Federation. 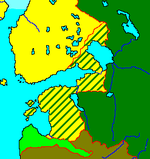 Its territory varied greatly during the Russian Civil War. Eventually most of the former lands of the Russian Empire were consolidated into the Soviet Union. The dissolution of the Soviet Union have led to the creation of independent post-Soviet states, with Russian SFSR becoming Russian Federation. Territorial disputes of the Russian Federation involve both post-Soviet states and other neighbors. 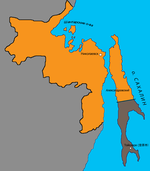 The Chechen Republic of Ichkeria was an unrecognized secessionist government of the Chechen Republic during 1991–2000, which fought two wars against Russia until the government was exiled in 2000. In 2014, Crimea was annexed by the Russian Federation. Serbyn, Roman. Lenine etla question ukrainienne en 1914. Pluriel no. 25, 1981. This page was last edited on 22 March 2019, at 19:15 (UTC).